Now let's get down to why you're here - the fake meat itself. This is my first time trying out a Gardein product. I'd heard good things, so I was kind of excited. I tore open the plastic packet and dumped its contents into a saucepan on the stove. After a couple minutes, it was heated through and bubbling. One problem though, right off the bat. These were supposed to be shreds, and for the most part they were. However, and I'm sure this is just a random packaging error, about a third of the volume was consolidated into one big blob, rather than shreds. I tried to break it up a bit, but it was pretty stubborn, so I just worked around it for my test. Before I potentially wasted a perfectly good bun, I popped a shred into my mouth, just to check it out. I was right to do so. The texture was definitely weird - very springy. As in, I bit down, and my teeth bounced back apart. The sauce it was in was an okay barbecue sauce. Not the best I've had, but decent. Unfortunately, it was overpowered by the gluten-y flavor of the fake meat. I took another taste, just to see if it was something I could get used to. The second bite was a little better, but still not something I wanted to keep eating. Even my exchange student, who will eat pretty much anything, opted for a veggie burger instead of this. 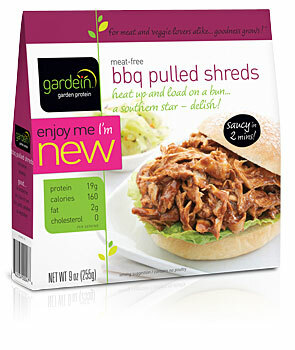 Tracy - I love your blog and have been hoping you'd start reviewing the Gardein products. 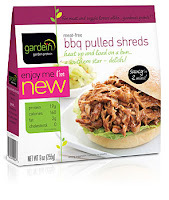 I had the same experience with these - actually I was prepared for a pulled-pork type substitute, and these did NOT hit the mark, but when I got in my mind they should be more like bbq chicken, it was a little better. But I'd seen such glowing reviews, I thought they were going to be amazing. Same thing with their buffalo wings - maybe you'll check those out. Gardein is offered in my local supermarket, so I was hoping their products would blow me away!